Coconut oil is used throughout the Caribbean and Southeast Asia, as well as North America. While it has a high saturated fat content, coconut oil is also associated with a range of possible health and nutrition benefits. There are two types of coconut oil: refined and unrefined, each of which has its own benefits and disadvantages. Sometimes called "pure" or "virgin" coconut oil, unrefined coconut oil is made from fresh vs. dried coconut meat. The oil is extracted either by a quick-dry method or through a wet-mill process. Quick drying, like the name suggests, dries the coconut meat very quickly, and then the oil is pressed out mechanically. Wet milling requires that the coconut meat is processed into coconut milk, and then by boiling, straining or fermenting, and using enzymes or a centrifuge, the milk is separated from the oil. Because both processes are quick, the coconut oil does not require additives or bleaching. It also retains more coconut flavor because it is not exposed to high temperatures. Refined coconut oil is made exclusively from dried coconut meat, which is known as copra. The meat has been bleached and treated to reduce potential bacteria in the coconut meat. Coconut oil produced from copra needs to be treated because the drying process produces contaminants in the copra. The coconut oil is then treated by a high heat process to extract the flavor and smell of coconut from the oil, and many producers will also use chemicals to extract as much oil as possible from the coconut meat. Frequently, sodium hydroxide is added to increase shelf life, although this is not the case with all refined coconut oils. Refined coconut oil is sometimes partially hydrogenated, which produces trans fats. A 1-tablespoon serving of coconut oil has 117 calories and 13.6 grams of total fat, the majority of which is saturated fat. It has no protein, carbohydrates or cholesterol. While coconut oil also contains trace amounts of iron, vitamin E and vitamin K, it is high in phenolic compounds, which are natural antioxidants. Unrefined coconut oil is particularly high in in phenolics. Antioxidants are naturally occurring substances that help protect your body's cells from damage from free radicals and toxins. When unrefined coconut oil is partially hydrogenated, the small amounts of unsaturated fats turn into trans fats. Organic, unrefined coconut oil is never processed with chemicals. Choosing an organic, unrefined coconut oil that has not been hydrogenated is the healthiest choice, if you can find it. Fewer chemicals used in treating the oil means there are fewer chemicals in the final product. Unrefined coconut oil is also more likely to contain no trans fats. Some refined coconut oils, particularly those used for commercial baking and chocolate, are partially hydrogenated. Trans fats are produced when hydrogen is added to liquid plant-derived oils, which makes them more solid, and they can raise your low-density lipoprotein levels. High LDL cholesterol can increase your risk of developing type-2 diabetes, heart disease or risk of having a stroke. 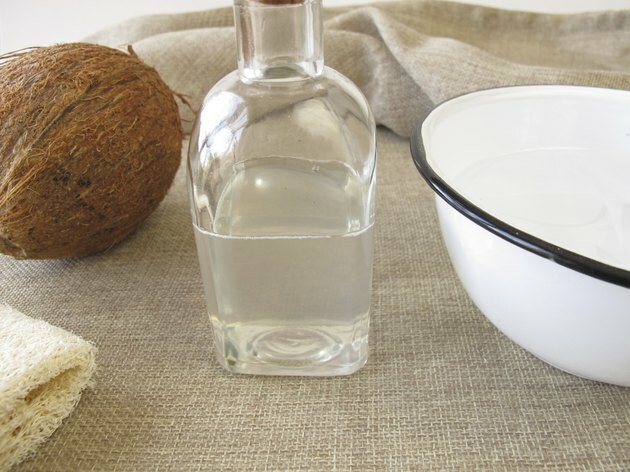 Tropical Traditions: What Is Virgin Coconut Oil? Academy of Nutrition and Dietetics: Coconut Oil -- What Is It All About? What Is the Difference Between Peppermint Oil & Peppermint Extract? Is Vegetable Shortening a Trans Fat?